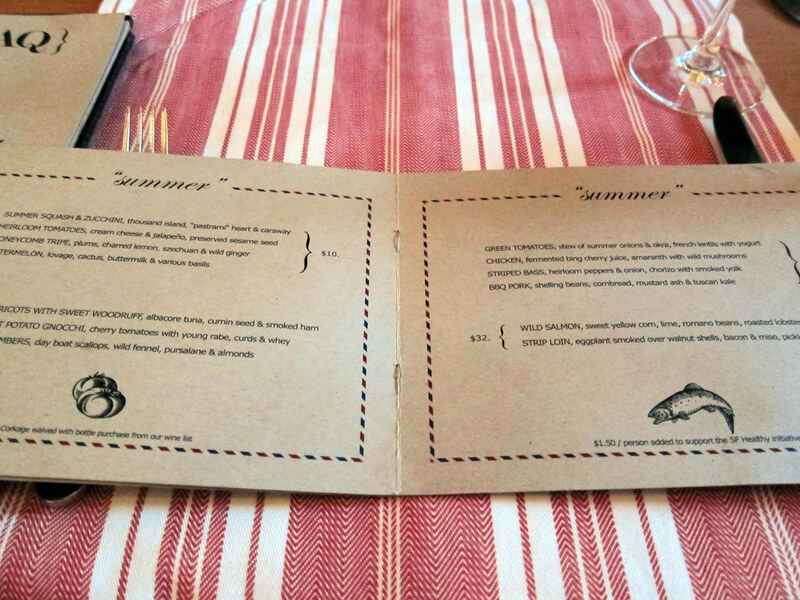 The menu offerings are fairly abbreviated and divided into four tiers of prices, from $10 to $32, based both on size and ingredient cost. The bakers' dozen of choices was supplemented with a couple daily specials. 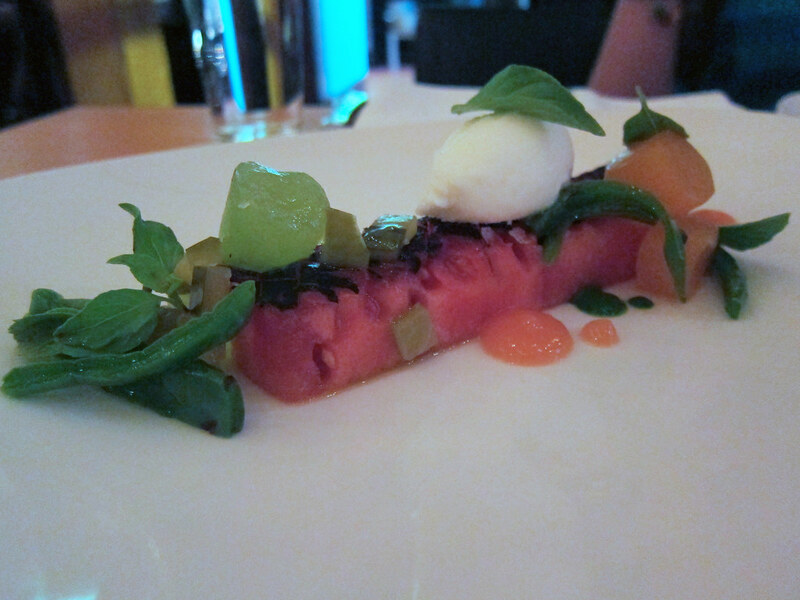 Watermelon, lovage, cactus, buttermilk & various basils. This was one of the menu items pilloried by Joyce Goldstein in her anti-tweezer-food screed mentioned in another recent post. And yet this was a dish that was perfectly evocative of the season. A rectangular slab of watermelon was charred on one side, paired with melon in various other forms, a quenelle of tangy buttermilk sorbet, leaves of different basils, some sweet, some spicy, a grassy lovage purée, and strips of cactus paddle. It conjured a summer picnic: juicy watermelon, green grass, even a whiff of the grill. Honeycomb tripe, plums, charred lemon, szechuan & wild ginger. If there is a tripe dish on the menu, invariably I will order it. This was like no tripe dish I have ever ordered before. The tripe itself, served close to room temperature, is cut into a julienne of fine ribbons, similar to what you'll find when you get honeycomb tripe in a dim sum parlor. The inflection of ginger is from the same place as well. But then it also gets a bolt of rounded acidity from charred lemon zest, a bit of szechuan peppercorn buzz, and finally, a bright fruitiness from a ruby-hued plum consommé poured tableside. A scatter of purple flowers (sage blossoms?) echoes the color of the plum broth. 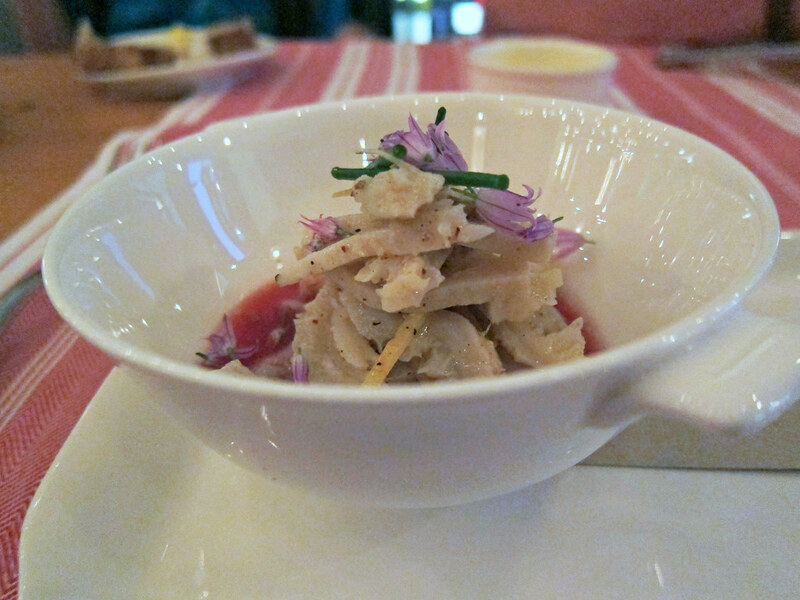 This dish was unusual and unexpected in all the best possible ways: a new take on an old ingredient, the tender ribbons of tripe a delicate foil for the bright flavors of the other components. Potato gnocchi, cherry tomatoes with young rabe, curds & whey. 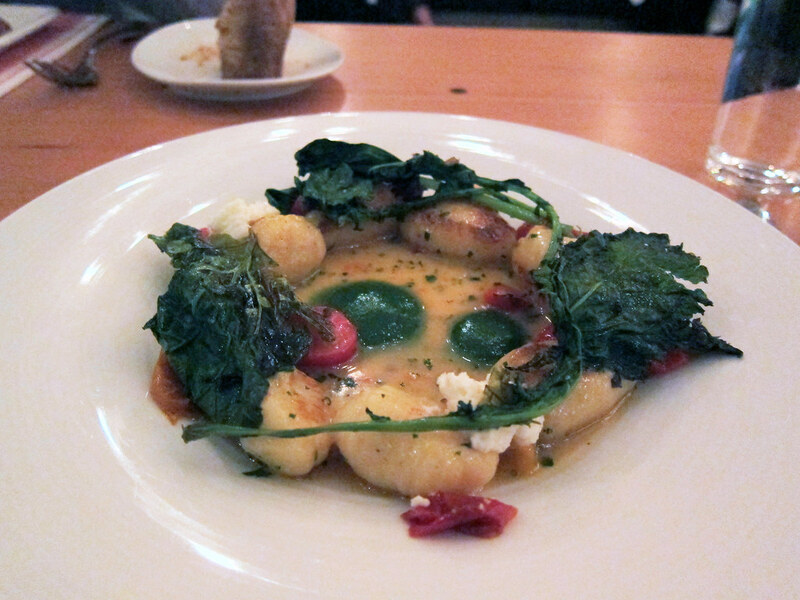 Tender gnocchi, toasted on their edges, were arranged in a wreath, draped with oven-crisped leaves of broccoli rabe, half-dried cherry tomatoes, soft, creamy cheese curds, a silky sauce of whey from the cheese, and puddles of an herbaceous green pesto. It was probably the most customary, straight-ahead dish that we had, good but not particularly memorable. 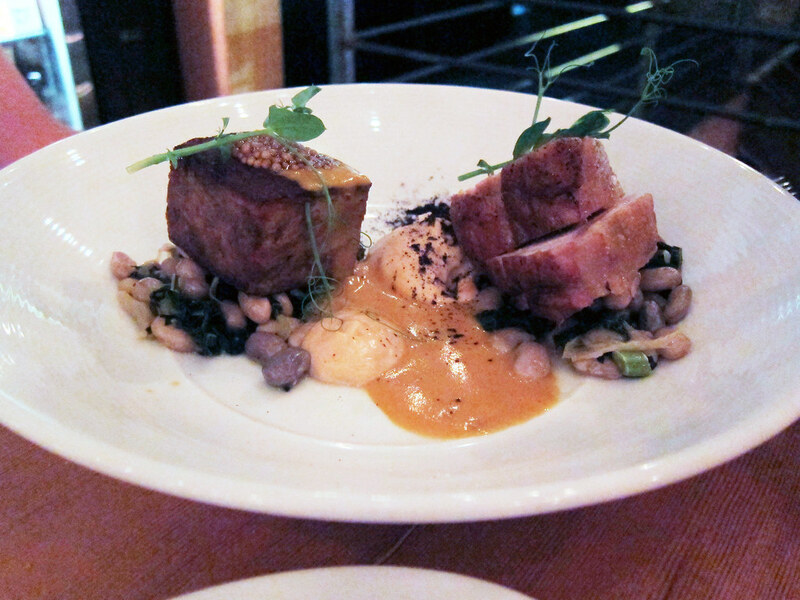 BBQ pork, shelling beans, cornbread, mustard ash, & tuscan kale. This was a much more refined presentation than you'd find at a backyard barbecue, but like the watermelon starter, it captured and then amplified those same flavors. The pork came in two forms - a couple thick, rosy slices of loin, and a block of tender shoulder meat that dissolved in fine shreds immediately upon coming into proximity with a fork. The composition was completed with beans in various hues, wilted kale, a runny liquid cornbread purée, and pungent mustard in several forms: pickled mustard seeds, dabs of prepared mustard, and a sprinkle of dark mustard "ash." Squab, peaches, sweet peppers, farro & tobacco. 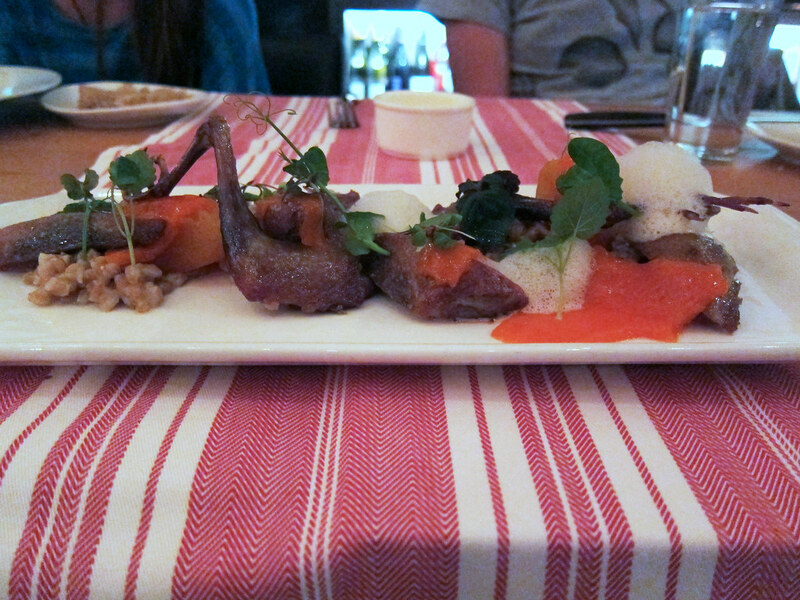 A daily special of aged squab was simultaneously the most inspiring and frustrating dish of the evening. The bird itself was wonderful: aged for 21 days, it had a concentrated meaty flavor inflected with a strong hint of almost metallic gaminess. And the peaches, perfectly ripe, with a plush, floral sweetness and acidity, were a great foil, while the chewy farro offered an earthy counterpoint. But the flabby sheets of red pepper gel and the poufs of tobacco froth felt and tasted extraneous; neither texture complemented the bird, neither of the flavors really jibed. It was also the only dish we tried that felt a bit out of joint from the seasonal motif, feeling much more autumnal than the other, more summery items we sampled. AQ has not quite worked its way around a full calendar of seasons yet, and it definitely feels like a young restaurant, one that is still looking to figure out its way and find its voice. 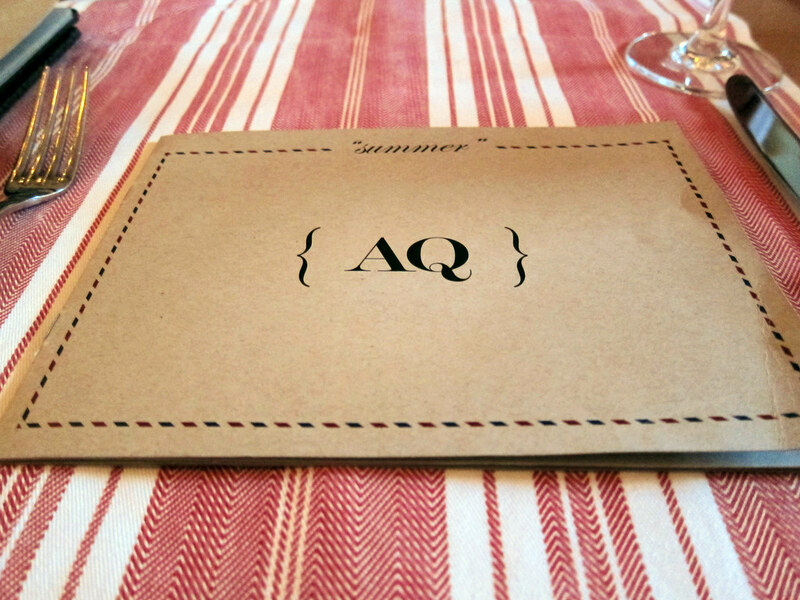 But I liked AQ's approach of bringing together ingredient-driven, seasonal cooking with more contemporary techniques. They're "doing something with their food," even if sometimes they may do a bit too much. He subsequently took that common refuge of scoundrels of all types, claiming the quote was "taken out of context" (while also describing the reaction to it as "retardedly stupid"). 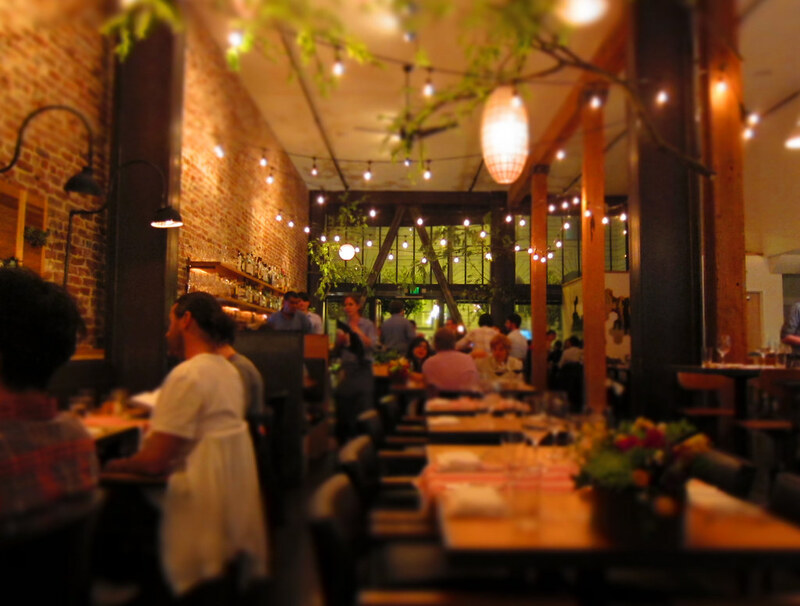 This isn't intended to dismiss places such as Daniel Patterson's Coi, or Chris Cosentino's Incanto, each innovative in different ways, and well ahead of the more recent wave of Bay Area innovators. 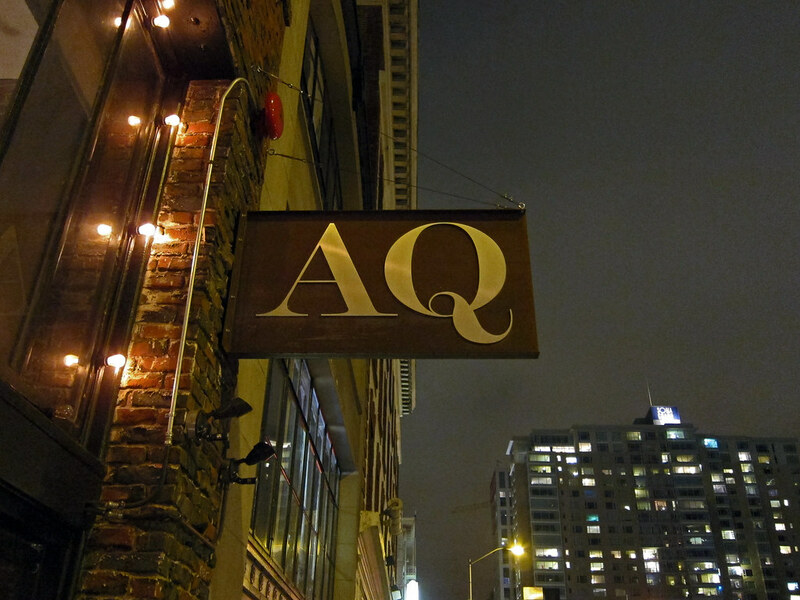 AQ, like State Bird Provisions which we visited the night before, was in Bon Appétit's list of the Top 50 Best New Restaurants of 2012; it was also a semifinalist for the James Beard Foundation "Best New Restaurant" award. Ironically, while San Francisco is seeing a resurgence of the creative impulse, so many of New York's hottest restaurants lately seem to be imports: Mission Chinese (from San Francisco), Pok Pok (from Portland), and Atera (Chef Matt Lightner, formerly of Castagna in Portland also) have been some of the most talked-about NY openings of 2012. I didn't realize it until after coming home and doing my research, but Chef Liberman actually has some South Florida connections: before AQ, he was the chef at the now-closed Forté di Asprinio in Palm Beach, which I visited about four years ago. I probably also ate his cooking when he was at L'Atelier de Joel Robuchon Las Vegas in 2007. It was only about ten blocks from our hotel near Union Square - but along that mile there is a bigger paradigm shift than when the "Wizard of Oz" goes from black and white to color. That is some rough turf.